Homemade sourdough pizza is an eye-opening experience, with so much flavor in the dough and a crispy chewy texture to the crust. I really want to make a pizza! If I had a wood fired pizza oven, I’d be on it like right now. (Too hot in my house, so no cooking inside for me). Although, I’d have to invite friends… you can’t make just one. I recently got a Baking Steel and made a small pizza using “Roberta’s Pizza Dough Recipe” 1/2 00 flour 1/2 all purpose flour + salt, water, little oil. Baked at 550* F for about 6-7 minutes. The pizza tasted good the top was just browned but the crust was like a stiff board and very chewy. The Baking Steel is amazing. I just bought the large 30lb version. Much better than a pizza stone. This looks great, Melissa. I have a question, though. The list of ingredients reads 120g of starter, but your levain directions are 45+45+45=135g. Are you returning the extra 15 to your mother starter? Just want to make sure I understand your directions. I don’t know why I’m intimidated by pizza, must have pizzaphobia, but I haven’t tried one yet. Maybe I’ll take the plunge some time soon. Thanks for the inspiration. The sourdough recipe looked good.mi made five crusts holding one out and freezing the rest. Would a 60 day freezer max time be ok? @fossilgal I didn’t go into this in the recipe blog, because stone practices/recommendations vary, but I have put my pizza stone on my gas grill and made pizzas there, comparable to indoor oven results. @singkevin thanks for the tip on the steel! @wendyk320 the extra starter is just so people don’t stress about scraping their jar and spoon. I probably should mention that I’d use the extra 15g but back into the mother jar is good too. @Bakerboy500 I’ve read that freezer up to 3 months is okay but I don’t have personal experience with freezing dough. Maybe others can weigh in on optimal dough freezing practices and timeframe. 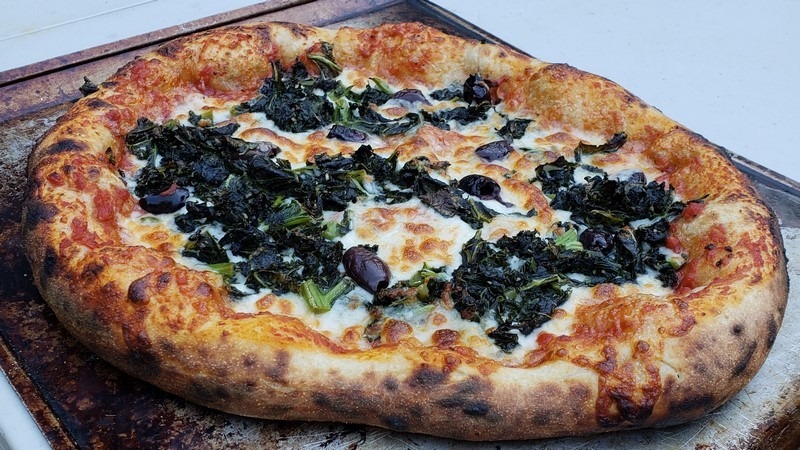 I’ve been looking for a new sourdough pizza recipe, and I’d really like to try this one. The measurements for the preferment are in addition to (not subtracted from) the main flour and water measurements, right? One more question about this formula, just to be sure I’m reading the process correctly. When the 135g. pre-ferment has risen and is ready to use, that’s when you add another 120g. of starter, right? In this case, if we count the pre-ferment, the total amount of starter would be about 255g. for the pizza dough. This is in my plans for the coming weekend, and I’m looking forward to it! I’m sorry the 135 vs 120g discrepancy is confusing! I think I’ll edit it. I wanted there to be a little wiggle room in the scraping out of starter and measuring. The starter is the preferment - not additional. In the past, people have asked how I build my starter, so I included that info, but really any ripe and doubled/tripled starter will work. This weekend I baked/broiled a great batch of pizza, and the starter was a nice active AP/Rye mix, about 110g. After kneading, I popped the dough in the fridge for 4 days! I took it out in the a.m. to finish the rise and fermentation by mid-afternoon when I shaped it into dough balls. I made the pizzas in the p.m.
Long story to say that there is a lot of flexibility…though perhaps my best pizzas have been from long retarded dough. That’s cool that it holds up so well for long periods of cold proofing. I’d really like to try that, but our fridge is so small, that I’m afraid my family would begin to resent the massive, stainless steel bowl occupying the top shelf for so long. Haha. Yes, refrigerator real estate can be an issue. Maybe a stackable tupperware type dough container could make the situation less obnoxious if you ever go the long-cold route. My favorite pizza is Mr. Gatti’s, but I can never make sauce that is as good as theirs. If anyone know a recipe for this slightly hot sauce, I’d pay money for it!!! My go-to sauce is the NYTimes “classic marinara” and it does have red pepper flakes and can be more or less spicy depending on how much you use. Other sauce notes: if I don’t have time to let it simmer, I add a tiny can of tomato paste to thicken. Also subbing in minced anchovies instead of some of the salt adds depth of flavor. @easummers gave me that idea! I know some people have already asked but I still need clarification… So you start with 45g starter added to 45 g water and 45 g flour, then after that ferments for 4-8 hours, you add an additional 120g starter and 600g flour and 390 g water? I think when i wrote this recipe, I’d been fielding some questions about starter build strategies. So that inspired me to be specific here with the 1:1:1 build, and I allowed for extra in the jar for people’s next bake. To clarify: build 135g of starter (45g:45g:45g); when it has peaked, use only 120g of it (or all 135g if you’re so inclined). Thanks so much! That makes sense, so the 600g of flour and 390g of water is in addition to the fed 135g of starter? Sorry this is all new to me! No worries! Yes, the dough ingredient list stands. Use 120g of the starter you grow (or 135g if you don’t want residue to build off of for another project).